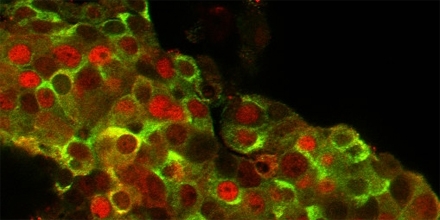 The image shows free-prepared islets of Langerhans dyed for insulin (green/yellow). The cell nuclei stand out in red. Diabetes research at Uppsala University is taking great strides forward. Transplantation of insulin-producing cells in the arm muscle is moving on to clinical trials. This brings hope that patients with juvenile diabetes, i.e. type-1 diabetes, will no longer be dependent on treatment with insulin injections. So-called islet transplantation is used to treat patients with the most severe form of type-1 diabetes. This involves injecting insulin-producing cells, so-called islets of Langerhans, into a blood vessel that leads to the liver, so the patient does not have to be dependent on insulin shots. But one drawback with this method is that a great many of the insulin-producing cells are destroyed immediately, since the blood reacts strongly to the insulin-producing cells. The researchers have therefore been looking for an environment where the insulin-producing cells can survive longer. “We wanted to put the insulin-producing cells in a tissue where they are not destroyed and can function optimally. This provides a better starting point for the patient. A muscle turned out to be a suitable place,” explains Olle Korsgren, who is professor of cell transplantation at Uppsala University and chief physician at University Hospital in Uppsala. The first patient received a transplant of cells in an arm muscle four years ago, in 2006. The first report about the method was published in 2008. “Now we will be following up patients who are treated with the method, ensuring that it develops, and investigating whether there are any counter-indications,” says Olle Korsgren. These Swedish scientists were the first in the world to test the new method. Now researchers in other countries, including France, are following suit. “We are delighted that it’s being tested elsewhere as well. This makes us even more confident about the ideas we have,” says Olle Korsgren. It is hoped that the method will replace today’s cell transplants to the liver within a period of two to five years.